Experience the southwest in this casual condo near Old Town. Our guests are relaxed and comfortable in this well appointed condo with pleasing furnishings and colors. Enjoy the outdoors and plentiful sunshine on two patios situated on the east and west sides of the condo. Refresh in the pool or relax in the hot tub. Walk, drive or take the trolley to Old Town restaurants, shops or art galleries. 1,120 sqf. condo including garage for storing golf clubs or bikes. Choose from two patios to enjoy the outdoors. We have visited Arizona for over 20 years when we bought our condo. It was a dream of ours to have a place in Arizona. We are extremely happy to share this wonderful place with guests that love this area as much as we do. We hope that all our guests have a wonderful experience staying in our condo. Our condo is located 20 minutes from Sky Harbor International Airport, a short five to ten minute drive to the 101 and a short walk to Old Town and many conveniences. The Scottsdale Trolley stops right on the corner from our condo which is free and takes you to many Old Town locations. Everything is included in the condo for all the comforts of home. The location is perfect for enjoying all that Scottsdale has to offer. The condo is nicely appointed and fully equipped to entertain or cook meals. The balcony, deck and fireplace round out a perfect package. Nice neighbors,too. Eve was great to work with, no problems. Very nice place, all the comforts of home. The condo and location were perfect for us. It was a treat to have a condo that looked like new with our own garage and two balconies. Also, you couldn't beat the location, close to old town Scottsdale, ball park, botanical garden, golf, hiking and biking etc.. Anxious to book it again. Oh, and the owners are top notch! I really enjoyed my time at this amazing place. Located on the 2nd level of a gated community, this unit came with 2 bedrooms, 2 baths and 2 patios, plus a full-size washer/dryer. It was spacious and came with ALL the in-unit amenities one could need -- including a community pool/spa & 1-car garage. The landlord was always prompt in her communications with me, and so very pleasant to work with. Of course, now that I write this and others find this hidden gem, it might not be available for me or my extended family should they want to book it in the future! I stayed in the condo for two months. It was a wonderful visit. It was spotless and had ALL the comforts of home. Eve, the owner, was a pleasure to work with. The condo is close to everything, some within walking distance. It was quiet, neighbors were very nice, pool and amenities were great. I would absolutely recommend staying here and would do it again, without hesitation. This is a quiet well-kept property with all the amenities, including an enclosed garage. 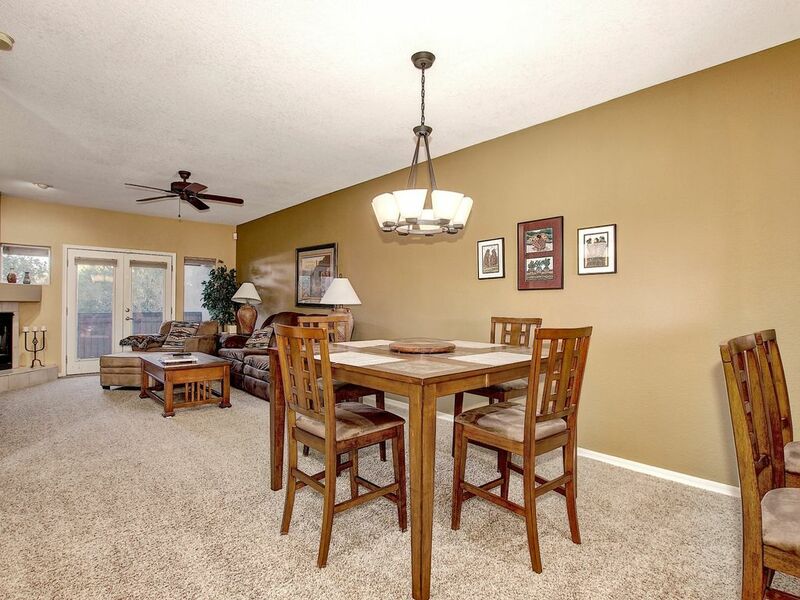 The condo itself is impeccably maintained and beautifully decorated. It is a 10 minute walk to Old Town Scottsdale. The owner is gracious and easy to work with. I highly recommend this property. Quiet and relaxing location yet only steps away from Old Town Scottsdale where you'll find unique shops, an assortment of dining experiences, music and arts. There is something here for everyone. This condo is located only minutes away from the Phoenix Sky Harbor Intl' Airport, Botanical Gardens, Phoenix Zoo, Fashion Mall, Scottsdale Center for the Performing Arts, Scottsdale Stadium and major highways that can take you to many day trip destinations in Arizona. Minimum Stay 30 Days No refund sixty (60) days prior to reservation. Sorry no pets or children. Rates do not include cleaning services of $105.00. Refundable security deposit of $300.00 required. 30 day minimum rental required. Sorry no pets or children.